San Francisco, CA - July 11th , 2014 - Fiilex, a leader in LED lighting for the broadcast, film and photo industries, is proud to announce that the Q500 has won the Cine Gear Expo Technical Awards from the Cine Gear Expo. Every year the judges, comprised of industry experts, put products through an extensive evaluation process, and give awards to only the best in each category. 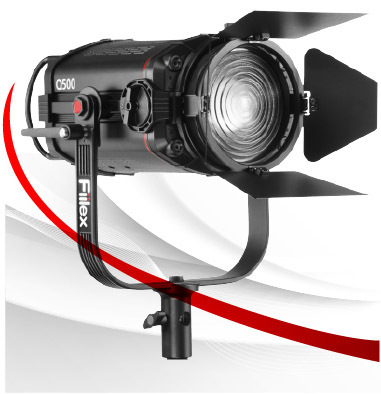 The Q500 is the only light, and Fiilex is the only lighting company to win an award from the 2014 Cine Gear Expo. "This is a tremendous honor for us, it is like winning the Nobel Prize of the Film Industry," says Brent Siebenaler the Brand Manager for Fiilex, "With the Q500, we set out to make a light that could open up new possibilities for filmmakers, to not just create a better LED light, but to build a better way of lighting. We are humbled to have our efforts recognized by the industry with this award." The Q500 is a specular LED light with an equivalent output of 750W (185W Draw). The light has an adjustable beam angle ( 27°-50° with the included fresnel lens), and can be shaped with the many available accessories. The Q500 can be tuned between 2800 - 6500K, and has a >93 CRI (3000-5600K). The light also includes Hue Control of ±.25 Magenta/Green. It is dimmable from 100% to 10%, and is "Flicker" free at any frame rate. It features a built in LCD display and is Fiilex's first light with Built in DMX Control (512 Addresses), connection is via the two XLR ports (in/out) or two RJ45 Ports (in/out). Light Intensity, Color Temperature, and Hue, can all be adjusted via the DMX protocol. The 2014 Cine Gear Expo Technical Awards are presented to the best debuting products that are unveiled in 2014. The winners are judged on site by a panel of industry experts with an eye toward the latest in technology. The judges carefully inspect every entry, assuring that the products live up to the manufacturer's claims, and truly represent technical and innovative excellence. If no product meets with their high standards, then no award is given out for that category. In 2014 two out of the six categories did not receive awards.